A really bad job that someone must do « Hercules and the umpire. At Thanksgiving dinner with Joan’s side of the family yesterday, I learned something. Because her family is very accomplished, I always learn something. Today, Nebraska plays Iowa in football. The game is the last game of the year unless Nebraska makes it to a bowl game. The football stadium in Lincoln (where we live) will be packed. Over 90,000 people will attend. Although Joan and I have season tickets, we won’t attend. We will watch the game on TV ’cause I am such a fanatic that there are not enough psychotropic medications in the world to calm me down during the game. Since my attendance spoils it for other folks, we use the season tickets as gifts. Sitting in our seats will by one of Joan’s sisters and her husband. While they too have season tickets, their children are in town and so the family will also use ours. Mary and Mark were at the doings last evening. Mary is a nurse, specializing in oncology. Mark is chief of gastroenterology at the medical school. He knows a lot about gastric fluids. Our seats are a part of a block of seats handed downed from Joan’s dad to the seven siblings. So, Joan and her brothers and sisters have had sat in the south stadium for a long, long time. They know the people around their seats. One evidently is a hard drinker. And that brings to my to the reason for this post. Some years back, Mark was in the south stadium. While you can’t legally drink at the stadium, that does not stop a lot of people. That day, the hard drinker was drinking hard. He got agitated at one point and stood up. Mark sensing disaster, stood up too. At that point, the man vomited a rather prolific amount of gastric fluids. Thankfully, the stream did not directly hit Mark, but landed where Mark had been sitting seconds earlier. The man was down and out. Security came and helped him leave. A single person followed the security people. That fellow wore a hazmat suit. What followed amazed everyone in the section. In just a few seconds, the hazmat guy began and finished an expert clean up, making sure to put everything he picked up or used in a bio-hazard bag. Mark thanked the fellow profusely, and remarked that the mess was pretty awful. The fellow responded nonchalantly, “It wasn’t bad at all. You should come with me to the student section.” That, dear readers, is an example of a really bad job that someone must do. Go Big Red (and sometimes yellow). Reminds me of the old Peter Cook comedy routine, in which he played a coal miner who wished he’d had the aptitude to become a judge – because one nice thing about being a judge is a complete absence of falling coal. (quoted here, since everything is on the internet: http://www.slaw.ca/2006/02/20/i-never-had-the-latin/comment-page-1/#comment-681 – very funny). Happy day after Thanksgiving to you. 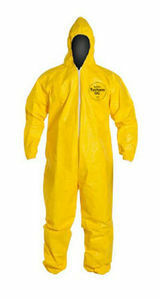 Yet ANOTHER reason to watch the game on TV: no need for hazmat suits! That is truly funny writing. Thanks a lot. Rich, the summer before I went to law school, I got hired doing maintenance work at a sewer plant. Sewer plants are sort of interesting. It’s a pretty complicated process to treat sewage to the point where it no longer presents an environmental hazard. The partially treated solid waste is (or at least was at the time) run through a cylindrical building called a “digester.” It has a floating roof on it that rises and falls with the amount of solid waste in there. However, in the “up and down” process some of the partially treated solid waste oozes through the gap necessary to allow the roof to float. Eventually there gets to be too much up there and the roof of the digester needs to get shoveled off. One day I got to work and everyone was getting into hip boots, gloves and getting shovels. “What’s going on, I asked.” They pointed me toward my stuff. “You’ll see.” So about 10 of us spent all day up on top of that digester in the punishing summer California sun shoveling off the roof. Whenever I was tempted not to do the reading carefully my first year in law school, I thought back to that day on top of the digester and re-opened those books. That was a really bad job. Actually on the whole the job wasn’t bad, but that was a really tough day at the job. But it helped me in law school. Plus ever since then, I’ve been immune to the smell of sewer plants, which is a bonus I suppose. Best, Pat. They’re 8-3 and beat Michigan (for that, I am thankful). Even if they lose to Iowa (I won’t tell you the score, so don’t read anything into that), they are assured of a decent bowl. As a CU grad, I can attest from experience that the Bugeaters travel well. A trifle obnoxious at times? Yes, but not nearly as bad as Michigan fans. Apart from that, you and my father are rather opposites. I recall a night when I was in Jr High, and Dad and I were in the bleachers watching the high school I would attend the next year duel with a state-ranked basketball team in the middle rounds of that year’s state tournament. My high school had no business being in that game; we’d finished the season in the middle of our conference, but we’d gotten lucky in the post-season. Anyway, there we are, late in the third overtime with the game still in the balance, the crowd on its feet, and Dad nodding off in his seat next to me. Bo got a personal foul penalty, Iowa got a field goal. Bo called for fake punt, punter caught before first down. Iowa scored. Nebraska is playing with a whole lot of kids who are hurt pretty bad. I feel for the coaches and kids. They are trying so hard. Three minutes and 45 seconds left in the third quarter. We are behind 14 points. We shall see. “The Hawkeyes managed a modest 281 yards, yet because they started seven – yes, seven – drives in Nebraska territory, had a quick path to the end zone in their 38-17 victory Friday at Memorial Stadium.” So, said the local paper. I heard the tail end of the broadcast on the Huskers Radio Network. The announcers basically gave up with about seven minutes to go. It sounded like a CU broadcast when we were REALLY bad. I make a comfortable living doing nothing more strenuous than thinking about things people ask me to think about. There is no heavy lifting; no shift work. I’m not required to drive through snow and I don’t come home smelling of fish. When I’m done thinking about these things, I give my “opinion” about them and start thinking about something else. Anyone churlish enough to complain about such a job, anyone who—asked so little—would fail to give every case, regardless of whether it’s handled by a successful attorney or a prison inmate, full consideration, is an ungrateful lout. —Justice William W. Bedsworth (4th Dist., CA CoA), Improper Persona, 45-Nov. O.C.Law 40 (Nov. 2003).